Home Looking For Owner of this rare 4 bedroom, 2.5 bath home on a cul-da-sac in the desired Steeplechase Neighborhood. This home has brand new paint throughout & has tons to explore starting with solid flooring sprawling through foyer, living room to formal dining room. From there find a large kitchen with lots of storage that is open to the family room that includes a cozy fireplace w/marble hearth. A patio and oversized yard are also accessible from this space for play and fun. Next head upstairs to the master suite that includes a full bath. Also upstairs are three ample sized bedrooms and another full bath. Back downstairs the basement is ready for finishing with lots of options. 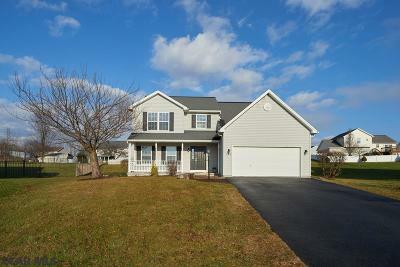 This home has a modest 2 car garage and full front porch, what more could you want. All this & more just minutes from I-99 and downtown State College or Bellefonte so you get best of both worlds. Open House 1/20.